Back pain is one of the most common medical problems, which will affect about eight out of 10 people at some point during their lives. It is also the number one cause of activity limitation in people younger than 45 years old, according to the National Institutes of Health. Back pain can be acute, which comes on suddenly and can last from a few days to a few weeks; or the pain can be considered chronic if it lasts more than three months. The type of pain can range from a dull, ever-present ache to a sudden, sharp, being-stabbed-by-an-ice-pick-like pain. Back pain can be extremely painful and debilitating. Luckily, in about 90 percent of all cases, pain can be relieved without surgery. However, half the patients who experience an episode of back pain will have a recurrent episode within a year. For most of my life I was always so grateful that I didn’t experience back pain like most of the people I knew. I felt lucky, because I have been involved in very physical sports since the second grade without any back problems to speak of. When I got into my 30s I had low back pain here and there, but it would go away on its own in a couple of days. When I was 16 I started weight training. I was fortunate to have national and world level powerlifters demanding proper form from the get-go. As I look back, these guys were so intimidating that I followed everything they said to a “T.” I’m sure this had a lot to do with extending the health of my spine. So many people play sports and weight train without the base of fundamentals I had. I must stress that I’ve never hurt my back while playing sports or weight training. Never did I think I would ever experience back problems. I’m a very health conscience guy. I train properly, I’m strong, my posture is good for the most part and I eat right. Boy, was I mistaken. In June 2007, after seeing two chiropractors with no results, I made an appointment with a local orthopedic surgeon. I had been having back discomfort for about six months that started to affect my job and my training. I’m a fireman, and picking up and carrying a 50 pound high rise pack, tools or wearing my Scott Air Pack was giving me some real pain. By this time, I had also cut out doing squats, deadlifts and stiff leg deadlifts because the discomfort was too great. The result of my doctor visit was an X-ray, a five- minute consultation and a prescription for Celebrex. I was told if it didn’t get any better in four weeks to schedule another appointment and we’ll get an MRI. But there is really nothing that can be done outside of some therapy and eventually surgery if it gets worse. I believe the doctor thought he was being encouraging when he told me, “Between the Celebrex and some therapy we should be able to keep you performing your job as a fireman, but weight training and rigorous activity would have to be kept at a minimum.” What the F**k! This just can’t be. This was the first of two surgeons I consulted with, both giving a similar diagnosis and future outcome. I was totally perplexed. That’s it. It’s 2008 and there’s nothing more that can be done. I just couldn’t accept that and started to do some research. I happened to come across a binder and VHS tapes I had purchased more than 10 years ago. “Active Release Techniques, Soft-Tissue Management System.” I had seriously considered becoming a certified ART provider because of the results that athletes were experiencing with treatment. I thought it would be a great addition to my personal training and strength coach business. Immediately upon seeing that binder a light went on. I wasted no time going to the ART website www.activerelease.com and found a certified provider in my area. Her name is Dr. Aliann Young, and she originally hails from Mahwah, New Jersey. She’s a graduate of New York Chiropractic College and has been a certified ART provider for eight years. Aliann weight trains, has run marathons and is well versed in holistic medicine. Her patience and expertise have made a huge difference in the quality of my life. By the time I saw Ali on Sept. 17, 2007, I was experiencing pain and stiffness, to some degree, 100 percent of the time. On a pain scale from zero to10, 10 being the worst pain I ever felt, I reported a three to eight, depending on the day. The pain had recently started radiating bilaterally into the buttocks, and I was also experiencing some “low back weakness.” I was having a great deal of difficulty at work, and my workouts were piss-poor to say the least. I also started to experience some depression because after being so active my whole life and loving my job, my prognosis for the future looked pretty grim. After Ali’s thorough assessment during that first visit, she devised a treatment plan that included muscle stimulation, chiropractic manipulation and ART to the associated muscles. After six visits Ali explained she would re-evaluate to determine the treatment effectiveness and adjust accordingly. I had seen, and heard, quite frequently, that athletes start to feel relief, even after the initial treatment. I wouldn’t have believed it if I didn’t experience it. The evening after my first treatment, and the next day, I had more flexibility and less pain than I did over the last several months. After three visits I couldn’t believe the progress. Fast forward to today. I have benefited so greatly from the expertise of Dr. Aliann Young (below), ART and disc decompression, that I felt compelled to get the information out to as many of our readers as possible. Bullz-Eye: For those reading this who have never heard of ART, can you please explain? Aliann Young: ART is a hands-on type of treatment for muscles, tendons, ligaments and fascia. Most of my patients describe ART as a highly specific type of medical massage. When I evaluate an injury, I touch the area to feel for fibrous adhesions. Fibrous adhesions can result from traumatic or chronic injuries. Once I locate a structure that has an adhesion, I treat that area and any other area I deem functionally appropriate. Often times, my history is rather detailed to find mechanism of injury and motions that reproduce the pain. BE: How does this differ from sports massage or deep tissue massage? AY: ART is very different from other types of manual therapies because it uses active and/or passive patient motion. Another big difference is the technique of the provider. ART focuses on tension along the muscle fibers, versus compression into the muscle fibers. All certified ART providers are very highly trained and required to take at least one re-credentialing seminar every year to keep in good standing. BE: I have heard of and have seen some remarkable success stories before coming to your office. ART seems to have an almost immediate effect, even with injuries that people have had for months and years. It’s been reported that ART has a 95 percent success rate. What has been your experience with your patients? AY: It’s hard for me to give an exact success rate without a statistical analysis of eight years. Generally speaking though, when a patient walks into the office, I first rule out any underlying serious problem. Secondly, I touch the injury, feel for adhesions, and look at what movements reproduce the pain. Once I have deemed a patient a good candidate for ART, I propose a treatment plan of three to six treatments. The number of treatments can also depend on the longevity of the injury. My experience has shown that in two to three treatments, the patient will start seeing improvements. If the patient does not respond accordingly, then another biomechanical analysis may be done or more extensive diagnostic testing. BE: I’m sure each case is different, but how many ART treatments does it take on average? AY: If an injury is caught early enough (within two to three weeks), it may completely resolve in just two to three treatments. Most often times, because athletes take such good care of their bodies, they respond very quickly. On average, six treatments will usually resolve 80 percent of cases. If an injury is chronic or very complicated, it might take longer, maybe 10 to 12 treatments. Some lifestyle choices and health problems can slow healing time also, such as: age, autoimmune diseases, diabetes, smoking, use of corticosteroids, lack of sleep, poor nutrition, etc. BE: How long does each treatment last? AY: Treatment sessions typically last about 15 minutes. BE: Once the adhesions are corrected is there rehab, or a periodic tune-up? AY: Yes, after the adhesions are cleared up, I recommend stretches and strengthening exercises to prevent re-injury. If a patient has a repetitive type job or is constantly training for an event, they may need to return to the office for a tune-up treatment. BE: Is it safe to assume that everybody, not just athletes, build adhesions in their soft tissue? AY: Generally speaking, any repetitive motion without sufficient rest can cause insult to soft tissues and cause fibrous adhesions. We refer to this mechanism as the Law of Repetitive Motion. This law can apply to anyone. BE: Will anybody experiencing muscle or joint pain benefit from ART? AY: Yes, most people having muscle or joint pain will respond well to ART. Some joint problems can cause inflammation in the soft tissues. ART can help reduce fibrous adhesions that may help break down the inflammatory process. BE: Well, I personally benefited greatly from ART, especially after six sessions. During the seventh visit, however, you ended up writing an order for an MRI of my lower back. What were your thoughts? AY: At treatment number seven, you had improved quite a bit. You reported a complete resolution of buttock pain, decreased severity in lower back and sacrum, and increased range of motion in lower back. However, considering your level of fitness and health status, I was not satisfied with your progress. 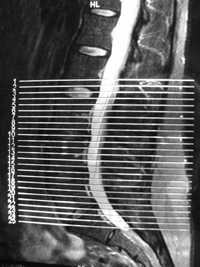 I wanted a lumbar spine MRI to prove to me this was the best I could get you. BE: That MRI bummed me out. It was not good news. AY: It wasn’t the worst I’ve seen, but no, it was not good news. The lumbar spine MRI and the results showed you had three disc protrusions (herniations) at L3/L4, L4/L5 and L5/S1. BE: Even with the success rate of ART and the use of chiropractic manipulation there are things that just can’t be fixed. I assume Father Time has a lot to do with it. How often do you see people who you wish would have come in months and even years earlier? AY: It happens a lot. When you’re young you think, “I’m invincible. I’ll never get hurt.” But years of abuse will catch up with you, if left untreated. Whenever a patient walks into the office, I am always optimistic and enthusiastic they will heal. BE: After seeing the MRI report you decided the best course of action would be a six-week spinal decompression program with the DRX 9000. Why did you feel I would benefit? And what happens to the spine and disks during these treatments? AY: Earlier I talked about underlying problems that might slow down the healing process. A lumbar (lower back) disc herniation is a serious underlying problem. Mike, you had three lumbar herniations! After reading the MRI, I was surprised you were able to walk. At that moment, I knew you needed something more to help heal the disc problems. The DRX 9000 Non Surgical Lumbar Spinal Decompression table was designed to help decompress the lumbar discs so fluid and nutrients could flow to heal the area. Essentially, the table is very sophisticated with two computers taking constant measurements of weights, angles, etc. Decompression takes the weight off the spine and discs to give the body a chance to heal. BE: I remember the day after my first session my low back felt like I had been hit by a car. I was so worried I called you. Was this a typical response to this treatment? AY: The first couple of decompression treatments can be tricky. As we try to change physiology of the spine, sometimes muscles can spasm in response to the treatment. It can be common, although other people never experience that post-treatment muscle spasm. Because you had three disc herniations, your case was more complicated than the typical case. I was not surprised when I received your phone call. After the next decompression treatment, we incorporated an ART session after each decompression treatment, and that seemed to prevent any additional post treatment muscle spasm. BE: How does the DRX system differ from other forms of decompression? AY: The DRX 9000 table was designed roughly six years ago and in my opinion is the best decompression table in the market. The patient is hooked up to two harnesses and placed on the table. The table lowers, so they are lying on their back, with a cushion underneath their knees. Most patients report the treatment is comfortable and relaxing. There was a study done using the DRX 9000 table to treat 219 subjects with disc herniations. The study concluded an 86 percent success rate of those subjects, in a clinical setting. After reading the study, the DRX 9000 was the only table to use. Unfortunately, there are some companies making cheaper versions of the DRX 9000 table and not producing the same results. If you decide to look into decompression treatment, make sure you do your research. BE: My experience with DRX has been phenomenal. I can’t believe the difference in my back. I went from literally have pain and tightness 100 percent of the time to being able to work, train, sit, stand, walk and even play basketball with my daughter with little to no tightness or pain. What have you observed with your patients who complete the treatments? AY: Mike, your results are typical for the decompression treatment. Our office is happy to report very good success rates because we only accept patients into our program who are appropriate candidates. Most patients who go through our full program respond very well and thank us for giving them their lives back. Chronic back pain can be very depressing because it affects everything you do. BE: I had a friend who just found out he has a herniated L-4, L-5 disk. I told him about my experience with DRX. He said he would bring it up at his doctor’s appointment. Well, he had an appointment with a prominent surgeon yesterday whom I’ve met, who told him traction has been around for over 200 years and if he wants to try to go ahead. He then told him the Celebrex, stretching and watching posture will be good enough. Does this surprise you? Why does it seem so common for physicians to reject alternative therapies? AY: Unfortunately, this does not surprise me. First of all, traction is NOT decompression. This distinction is very important. Traction is a sustained pull on the spinal joints and NO specific disc level. Traction has also been proven in clinical studies to increase intradiscal pressure. Decompression pulls at the spine in a cyclical pattern where it gradually increases to a maximum weight, and gradually decreases to a lower weight, and so on. The DRX decompression unit can also target a specific disc level. No traction machine can do this. And most importantly, decompression has proven in clinical studies to decrease intradiscal pressure to -100mmHg. I have included the references below. Another interesting point is most of these studies were done by medical doctors and published in medical journals. I’m not sure why some doctors don’t recommend decompression, but our office is working on changing that. Actually, we have two local family doctors that are referring us decompression patients. It’s hard for any doctor to be aware of all the newest technologies. I always encourage patients to do their research and present the information to their doctor. A good doctor is always willing to listen and learn from their patients. BE: I guess this brings me to a deeper question. What is the major difference between a chiropractor and a medical doctor? I remember you once told me you hope chiros don’t have the ability to write prescriptions. I found that discussion enlightening. Can you please give your thoughts? AY: Chiropractors and medical doctors have very similar training. The first two years of chiropractic and medical school are basically the same. Both schools teach the really hard courses such as histology, biochemistry, anatomy and physiology, neuroanatomy, etc. After the first two years, that’s where the education starts to diverge. Chiropractic school teaches students to diagnose and treat conditions without the use of medications or surgery. Medical school teaches students to diagnose and treat conditions with medications and surgeries. Basically, it comes down to philosophy. Chiropractic philosophy is based on the body’s ability to heal itself without the use of drugs or surgery. I feel that any doctor, whether you’re a chiro or M.D., needs many options when trying to help patients heal. Also, every patient is different. Some patients may respond well to chiropractic and not well to medicine. And vice versa. Truth be told, this society needs both medicine and chiropractic, when appropriate. As a modern health provider, I am open to all types of treatment. BE: Your facility is great. Dr Geoffry Poyle has done a wonderful job of assembling an accomplished team. The Avon Lake Wellness Center is a very clean, professional, friendly place. You offer other therapies besides chiro and ART. If you would, give the readers a list of your alternative therapies and a brief description. AY: At the Avon Lake Wellness Center we also offer massage therapy, thai massage, acupuncture, and nutritional consultations. Massotherapy: We offer relaxation massage, deep tissue massage, hot stone massage, facials and thai massage. Acupuncture: Acupuncture is the insertion of fine needles into specific points along the meridian lines. This treatment has been around for thousands of years and helps balance energy flow from one area of the body to another. Nutritional consultations: Our consultations focus on educating the patients on whole food nutrition and holistic healing through vitamins and herbs. A consultation can be geared towards weight loss, hormonal problems, infertility, digestive problems, etc. We also do hair analysis testing, saliva hormone testing and detoxification programs. BE: You recently have started a new project dealing with infertility. Are you collaborating with anyone and how can this benefit some of my readers? BE: Ali, thanks so much for taking the time. It’s always nice dealing with people who have such experience and insight. It’s evident you care very much about what you do and truly have a desire to get people well. AY: Your welcome, Mike. It’s been a pleasure to work with you!